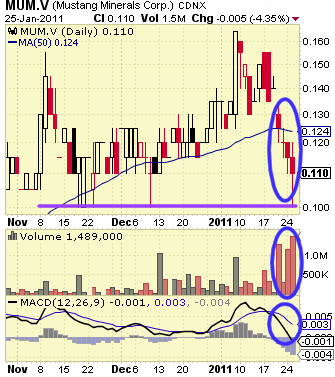 For some time now the shares of Mustang Minerals Corporation (CVE:MUM), (PINK:MSMGF) have been moving down, to the disgrace of the company's managers. Within two weeks, MUM has slipped 33% on the Canadian Venture Exchange (CVE). Perhaps this is no such a big surprise. The decline comes just after the stock had noted a one-year record of $0.165 per share on the CVE. This happened on the day when Mustang announced the closing of an approximately $4M financing. It is not unusual for a share price to fall after reaching new highs. That is why the current plunge is maybe not so alarming and should not be accepted with panic. Mustang Minerals Corporation is engaged in mineral exploration of properties in Manitoba and Ontario. The focus of the company is the nickel-copper-platinum group metals mineralization. Yesterday, the company came up with a fresh press release announcing the start of a drilling program at the Mayville Copper Nickel Property. So far, this has not impressed investors in any way, and the share price continued to fall. Furthermore, it does this on rising volumes - yesterday's turnover was a record for the last three years. All other news issued by the company recently were related to the raising of funds through the closing of private placements. The generated cash is intended to be used to complete a feasibility study for the Makwa Nickel Project, to acquire a nickel concentrator plant and conduct further exploration at the Manitoba properties. The company's financials suggest that Mustang probably needs additional cash to manage its projects in a proper manner. For the quarter ended Sep. 30 2010, the company had a net loss of about $5K and a working capital surplus of only $692K. This is hardly enough for the financing of its four properties. Taking all these factors in consideration, we might assume that it is difficult to expect substantial appreciation of the company's shares in the near future, though the prices of nickel and copper have been going up over the last two months. Perhaps, MUM could find support at $0.100 as the chart suggests.